The prosecution has rested its case and the defense has begun theirs. All things are pointing to an uphill battle for Raj Raj's legal team led by John Dowd. The U.S. presented a rather damning and damn extensive list of evidence, including numerous taped conversations between Rajaratnam and his alleged partners in crime. Yesterday, Dowd attempted to discredit Adam Smith, one of the prosecution's star witnesses. Today, Dowd is attempting to call to the stand some nice guys who will paint a nice picture of Raj's nice side. So far, the judge has not been very accommodating. While close watchers of the case such as the Times' Andrew Ross Sorkin believe big Raj Raj has a slim chance of being set free, others say Raj has a decent shot of winning on appeal. There's been a major development in the case against the ex-trader Bauer and the ex-M&A lawyer Kluger. 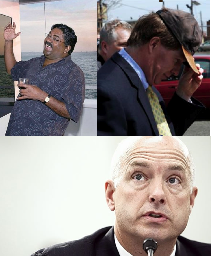 The name of a previously unnamed co-conspirator of the two men has been discovered to be Kenneth T. Robinson, a 45-year-old resident of Long Beach, N.Y. Robinson was the supposed middleman between Bauer and Kluger and claims that at some point during the nearly two decade insider trading scam, there was also a fourth conspirator. Robinson has pleaded guilty, hoping for a good deal (a.k.a. a light sentence). He is currently free on a $2 million bond. His sentencing is set for July. Meanwhile, Bauer is free on a $4 million bond, after appearing yesterday in court in "designer jeans and a sweater" (going for the casual who me? look). For the time being, Bauer has been allowed to hang tight in his multi-million dollar Manhattan roost with an electronic device strapped to his body. Also, in no surprise, he's been banned from trading securities. Despite some rather solid evidence in the prosecution's pocket (wire-tapped conversations in which evidence destruction among other dubious activities were discussed) the ex-SAC Capital fund manager Donald Longueuil and ex-Primary Global Research consultant Winifred Jiau have moved to dismiss the insider trading case against them due to lack of evidence. Both of the accused stand to receive sentences, if found guilty, of up to 25 years. As you may recall, Longueuil and another party involved in this case, Noah Freeman, used to be very close buds until Freeman agreed to rat out Longueuil. As part of that ratting out agreement, Freeman secretly taped phone conversations with Longueuil in which Donnie admitted to tearing apart a few incriminating-evidence-carrying USB drives with a pair of pliers. Although no case (insider trading-related or other) has been brought against David Sokol, Warren Buffett's ex-right-hand man who abruptly resigned from Berkshire Hathaway two weeks ago amid allegations of shading dealings that sure as heck reek of insider trading-related activities, further info surrounding Sokol's purchase of Lubrizol stock has been revealed. Today, according to a Lubrizol proxy statement, Sokol was indeed aware back in mid-December that the board of Lubrizol had planned to take the idea of a sale to the Berkshire board. Previously, it was unclear if Sokol had that knowledge before he bought Lubrizol stock in January. That is, Sokol's purchase now looks a shade or three shadier. Still, there's been no further word on the matter by Buffett. But you can expect the Oracle will say something soon -- when he 's barraged with Sokol-related inquries at the annual Berkshire Hathaway shareholder meeting on April 30th.